So the plan for the new residential house is to include polished concrete floors. How does the process differ from having tiled, carpeted or timber floors? We outline what you can expect and how to prepare for polished concrete floors in a residential house build. Choose concrete mix and colour. Concreter pours slab following guidelines for polished concrete. 1st Stage: Grinding - CCC pre-grinds the slab approx seven days after the slab is poured to the desired exposure before wall framing or any other construction work commences. Builder commences and completes the frame. Floor protection put in place. Prior to occupation wash the floor with tough green (low PH cleaner) as specified on our maintenance sheets. Please note that these are general guidelines. In our experience each job has it nuances and may require a slightly different approach and timings may differ depending on the layout and conditions. * It is imperative that plastic is not used after the 2nd stage to cover the slab. Plastic will cause the concrete to “sweat” which can cause blotching. ** If there are to be no skirting boards or P50 is being used, we need to return EARLIER. This is to minimise any risk of damage, ensures the best finish and saves labour costs. Place layers of carpet outside of the main traffic areas and put up signs acting as a reminder to contractors and visitors that the slab is going to be the finished floor and should not be damaged. For protection, breathable materials such as Ramboard ®, plywood or painter's cloth drop sheets are recommended (not plastic). What if my frame is already up before we decide to polish? If your wall frames or even plaster has already been installed we can still polish your floor. The approach will be similar to what we would do for an existing dwelling. 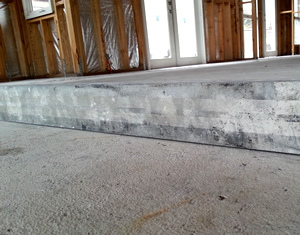 What if the framer or another contractor damages the floor after it has been initially grinded? If the floor has been damaged after pre-grinding (i.e. a hammer or chisel is dropped directly onto the concrete from a high level or a nail has been hit into the floor) we can repair the floor however as outlined in our FAQ about grouting, there is no guarantee that the repair will not be noticable or inconspicuous. Prevention is the best measure and we will recommend methods of protecting your floor during construction that is suitable for your layout and situation. How do I protect the floor during construction? Methods of protection of floors during construction can differ from room to room, i.e. areas that might be subjected to water during building, open outdoor areas, large spaces, as opposed to smaller but busier thoroughfares etc. We generally advise the builder and/or owner to protect floors using suitable products for the different areas with materials that typical include Ramboard ®, plywood or MDF sheets, painter's cloth drop sheets, layers of carpet outside doorways etc. Will my concreter know how to pour the slab correctly? A concreter should know the techniques required in pouring a slab so that aggregate is dispersed consistently and so that the concrete is ready for the type of final exposure and finish required. Check our concreter's procedure sheet or contact us, or have your concreter contact us for assistance. What if the finished polished concrete floor gets scratched during the final part of our house build? If it is a grind and seal finish we may have to sand back the scratches and re-coat (at an extra expense). A machine polished floor however is so much more resilient to scratching that it is not usually a problem as the floor will be much more durable than a grind and seal finish. This more durable finish we often refer to as CCC Polished Concrete. Where can I see polished concrete floors so that I can choose the mix type, level of exposure and finish type? Come and visit our Croydon showroom or a polished concrete showroom in your area. I am still not sure about the concrete polishing process for a new home; can I talk to someone? Contact us now or read through our website.